Here for the download? It’s at the bottom. But why not read your way there? However, a good mix of the first 3 models is the most realistic and also the easiest to maintain. 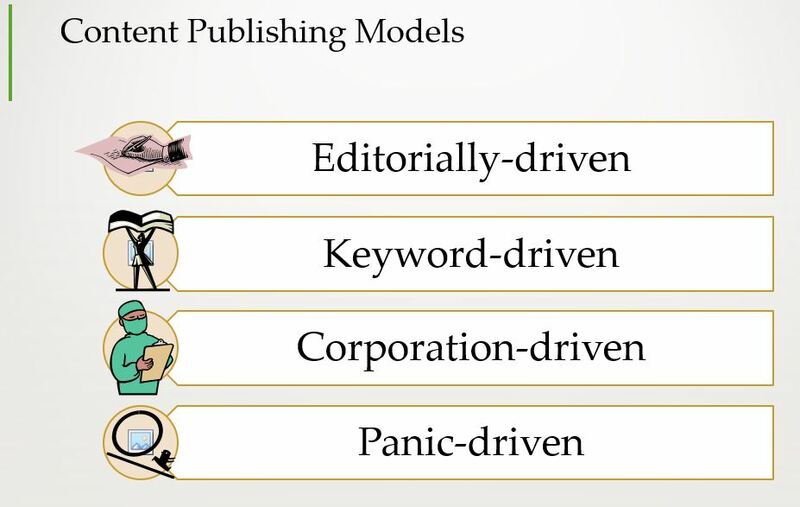 Exactly what it sounds like – a group of editors and writers determine what topics to write about, create a schedule, and publish accordingly. Hopefully, they engage the SEO team at some point to make sure they’re using basic techniques like H1 and H2 tags and writing relevant titles and descriptions to help click through rate from the search engines. Also just what it sounds like. Includes things that the corporation or legal department says you must post. Legal disclaimers, press releases, event announcements, and product specifications all fall in this list. These can be optimized for SEO (all content can), but the creation of the content itself is the focus, not where it will rank after it’s posted. Often the marketing team has little power to make any changes to this content, and SEO’s involvement should be primarily focusing on technical aspects. For example, corporate driven content is likely to be duplicated across multiple sites. Another way to think about this is “Customer Driven Content”, but I call it keyword driven because that’s where it starts – with the keyword or search query. Each SEO query has three main elements to it – the search volume, the current rank, and the intent. To effectively compete for keywords, you need these three things to line up. The query is a good match for the page and the intent of the searcher. The query is the best you’ve got for that topic, and more/different content may be required. The query is not a good match, and you need to direct it elsewhere. Second, the query intent. Certain queries “want” certain types of information. For example, a comparison style keyword like “compare”, “best” or “top” will never rank for a page where only one product is featured. The query wants variety. Further, queries often “want” independent verification. So for a query like “review of iphone 8”, Google wants to show almost any other page other than one from the company (Apple) that carries that product. Need more proof of this? Do that search, and you’ll see that no result from apple.com appears within the top 20 positions. Customers wouldn’t trust a review of Apple by Apple, and Google knows that. Transactional: action keywords like “buy”, “find”, and “get” – these need to point to specific product pages and categories. Sometimes the “buy” or other action word is not stated specifically; it’s implied. Informational: this is 90% of all queries. Searchers are seeking unbiased information, often about a product or service. If the query doesn’t fit directly into the two categories above, it’s probably informational. This is the perfect content for blog posts, but does tend to be fairly long tail. Third, the search volume. It is an afterthought, nothing more. We use this to determine what specific words and phrases to use in an overall topic. Product Content: This content that your product team writes – it’s promotional, describes products, and puts the company in the best light. It may spill over into the blog with posts like “featured products” or “gift ideas”. This content reaches your customers when they are ready to make a purchase, and know what they want, but may be comparing prices or options. Informational Content: This is primarily on the blog, but is also a lot of what we see in a knowledge base or resources section of the site. This is content like “how to”, “what is”, “can I” and is critical to overall SEO success. This is the type of content that meets customers at their earliest levels of the buying cycle, often before they are ready to make a purchase. Time-based content: This is the area that most businesses miss, but which is critical to establishing your brand as an authority in your industry. It’s fresh insights into the industry, tracking regulations, commenting on the topic of the day. It’s critical content for overall success in terms of freshness, and it’s also the most likely to get shared on social media. Identify the intent of each keyword or keyword topic you want to rank for. Is it navigational, transactional, or informational? Identify the stage of the buying cycle for each keyword. What type of content will reach this user best? Map each keyword to a specific piece of content, keeping in mind any that you already rank for. Use data from analytics to make your case if the keyword currently ranks for a page but the user experience is not good. Bounce rate, exit rate, time on page, and goal completions are all useful metrics when used at a page-specific level and with clear understanding of what the page goal is. Be realistic about the page goal. A user is unlikely to complete a purchase or a lead after reading a single page of informational content. A realistic goal may be to download something with more information, to read an additional page, or to share the page on social media. These micro-conversions often lead to more impactful conversions later. Understand this won’t happen overnight. Setting up the content map is challenging and time consuming, but it will lead to better decisions, an editorial calendar, and eventually, better positions in search with better conversion rates. Still struggling or need some help? Contact us to set up a keyword/content mapping consulting agreement. In the meantime, feel free to use our keyword mapping template (download) to help you get started. When you’re ready to go to the next level, check out the KICC Method©!